Following a week of turmoil in federal politics that ended with a new Prime Minister and disappointment among some stakeholders over the failure of the aged care portfolio to be elevated to the inner ministry, Labor has called for a bipartisan approach to long-term reform in the sector. Labor’s spokeswoman on ageing Julie Collins on Tuesday used the aftermath of the upheaval to foreshadow Labor’s policies should it win government at the next election. While being light on specific details, Ms Collins said in an address to a LASA breakfast in Perth on Tuesday that Labor would prioritise transparency and strive to boost and upskill the workforce. Ms Collins said it wasn’t possible to commit to long-term reform from opposition but Labor wanted bipartisanship and openness about what is going on in the sector, and took another a dig at the government for its delay in releasing the latest home care data that showed more than 108,000 people on the waiting list. “I don’t think we can go forward without bipartisanship long term in aged care. What that requires of the government is more transparency around decisions, around what is actually going on in the sector,” she said. She also said there was a need for more aged care workers and Labor believed government had a role in finding, training and equipping them with the skills to cope with changes in technology. Following last week’s change in leadership, Scott Morrison, who as treasurer gave a spirited defense of the government’s action on aged care at a budget reform conference in July, was applauded by peaks for identifying the sector as a priority in his first speech as PM. 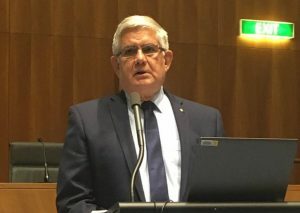 He also reappointed Ken Wyatt to the aged care portfolio and his move to widen the ministry to cover senior Australians drew praise from stakeholders. However LASA was left disappointed that a dedicated aged care minister had not been included the cabinet, with CEO Sean Rooney saying the changes at the top had presented “a clear opportunity to acknowledge ageing and aged care as issues of national importance”. My Wyatt said on Wednesday his appointment as Minister for Senior Australians and Aged Care reflected his focus on taking a broader, whole-of-government approach to advancing the interests of senior Australians. “Our senior Australians are among our country’s greatest treasures,” he said in a statement. Whether bipartisanship can be achieved as the nation heads to the next federal election and beyond, or whether aged care will turn into a squabble for the political high moral ground, is yet to be seen. Read more about reaction to the political changes here .